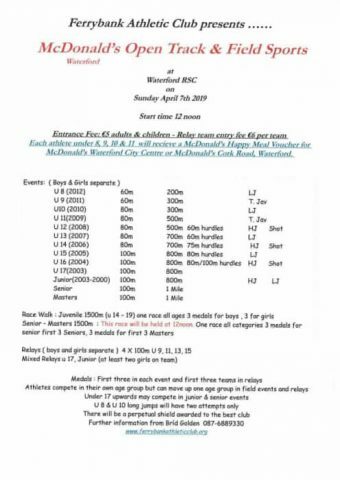 With day 4 (hurdles, middle distance and field) of the championship concluded on Sunday, March the 11th, the curtain closes on a fantastic championship for the club. We owe all the athletes, coaches and families a debt of gratitude for their efforts in training, travelling and competing to the meets in both Athlone and the National Indoor Arena. We had a 42% increase in participation numbers, with many athletes making their indoor debut from u12 upwards, and there were great performances throughout all the ages. Kudos to one and all. We took home 16 medals across the four days. In 2017, we took home 7 medals. We have to make a special mention of our relay teams who performed excellently in the National Indoor Arena, in particular, our Boys u12 squad of Daithi, Liam, Darragh and Ben, who dominated their heat and were so unlucky not to medal in the tightest of finishes. There’ll be other days for them.